Tires are one of the most important parts of your car in terms of safety and performance. They even have an enormous impact on gas mileage and fuel consumption. It’s important to routinely check the tread of your tire. Car experts recommend that the tread depth be at least 1/16 of an inch. It’s also important to make sure that the tire pressure inside of your tires is the proper tire pressure designated for the vehicle. Taking care of your tires will mean you get the most mileage out of them. The experts at Cars.com suggest that some new car tires could last up to 50,000 miles if well cared for. Some car manufacturers put softer tires on brand new cars which mean a great, quiet test drive but no long lasting tires after your purchase. If you’re faced with putting new tires on your brand new car after only a couple of years, this could be the case. When the time comes to buy new tires, here are a few things you should know. If you’re not familiar with tire sizing, you will need to check your current tires for the size. Your tire size will be a combination of letters and numbers. The first number in the series might start with a P which stands for passenger vehicle and be followed by a three digit number like 215. This designation represents the width of your tire. This letter number combination will be followed by a slash and another set of numbers will follow. The next sequence will include two numbers followed by one letter and two additional numbers. A typical sequence would be 65 R15. This sequence of numbers and one letter represents the aspect ratio of the tire, the tire construction and the diameter of the wheel in inches. A quality tire shop or mechanic will hear everything they need to know once you give them this tire size. When you start shopping for new tires, you will need to have this tire size sequence handy. You can either call local tire dealers and give them the size, make and model of your vehicle. Or, you can shop for tires online with using the size, and have them shipped to a participating tire installation center in your community which can present significant savings on your tire purchase. Holidays are great fun; we look forward to them all year, and they seem to come and go in the blink of an eye. So it’s important to make the most of them and do everything you can to have the best possible time. Of all the holidays you’ve been on it’s unlikely you’ve been on holiday on a motorcycle before. Motorcycles are awesome. They’re fast, don’t take up too much space, and they give you the freedom to go where you want. You might think about traveling around by motorcycle on a regular holiday. But if you want to go one step further you could even think about going on a road trip holiday on your motorcycle. Maybe you could get some friends to go with you, or perhaps you’re the sort who enjoys your own company. First up, of course, you’re going to need the bike itself. But going on holiday on your motorcycle is a lot different than driving it to work or around the local area. For one thing, you’re going to be on the road a lot longer. You might also need to negotiate uneven terrain and adverse weather conditions. Because of this it’s important to make sure your bike’s been well serviced and taken care of before you go. No road trip would be complete without supplies. You need to make sure you have plenty of food and water with you at all times. You might be riding for a long time. You may be traveling across hot, arid countries. So you need to make sure you’re hydrated and fed. This way you’ll keep up your energy levels, and you’ll stay safe. You might also want to think about packing a map and compass or GPS device, along with a spare canister of fuel. You will most certainly need these things at some point. It’s all well and good taking all this stuff with you, but you’re on a bike, so you need somewhere to store it. It’s not like you can just pop the trunk and fill it with stuff. And you can’t very well carry things in your arms. 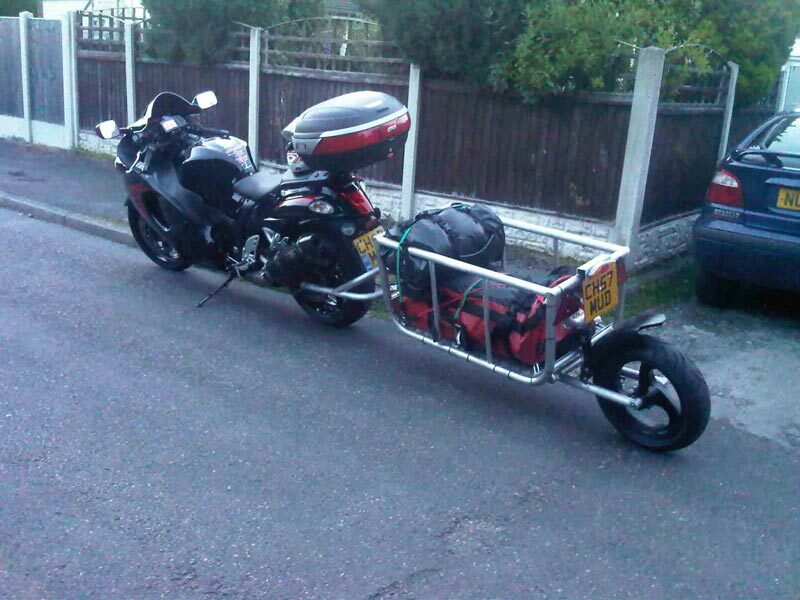 What you need is one of those pull behind motorcycle trailers that can carry the heavy load. If you can hook one of these up to your bike, you’ll be able to fill it with all the essential supplies you need. This way you get the useful practicality of having a boot, but you still avoid having to take a car. Don’t forget that even though you might be limited for space you still need to pack clothes. You are going on holiday, after all, remember! But you don’t need to pack as much as you would if you were staying in a hotel. You might be a light packer. And you might decide you want to take the bare minimum of clothing and then buy clothes on the road. This is a useful way of keeping your packing light and being able to get ahold of clothes more appropriate to the local climates. From gourmet meals to adventurous black runs, romantic evenings in to early morning snow fights, a family skiing holiday has something for everyone. Make sure you get it right with our top five tips for success. Obviously we are all slaves to the school holidays. Since this restricts us to expensive, busy periods, it pays to do your research and make sure your break coincides with the best snow. If your kids are too young for school, make the most of it and opt for off-peak weeks in January, March and April. For slightly older families, the Easter break is a great choice. The weather in European destinations is not only warmer during March and April, but the daylight hours are longer too, giving you the most time on the slopes. Accommodation choices for skiing holidays are very varied and largely dependant on your destination and budget. A great way to keep the costs down on a skiing break, inviting other families with children of a similar age makes hiring whole chalets cost effective. You can also tag team the child care responsibilities, giving mums and dads the opportunity to have an evening alone. If you have slightly older children, a club resort is the answer. With a choice of evening entertainment, daytime activities and a safe environment, teenagers have the freedom to do their own thing. Not sure what’s the best option for you? Companies such as Momentum Ski can advise you on all the available options and suggest which will work best for you. If you want to make sure you’re ready to hit the slopes the minute you touch down, taking lessons at an indoor slope at home might be just the answer. These are also a great way to introduce the kids to the basics before they hit the nursery slopes. Giving everyone the confidence they need to feel safe on the mountains can make all the difference between a great family experience and a holiday flop. Most popular ski destinations offer a variety of childcare options, from private nannies to English speaking creches. These are all in very high demand and often booked up for weeks, so it pays to book childcare well in advance. Renting ski equipment at your destination is the best way to save on extra baggage costs and the inconvenience of carrying heavy bags around. It is best to work out exactly what everyone needs and pre-order it, since demand is always high, and many resorts have limited numbers of items in childrens sizes. This sounds a bit counter intuitive when you’ve spent a small fortune flying the family out to the ski slopes, but it is important for family harmony if nothing else. You might be happy to tolerate the cold for long periods but it’s a new environment for the kids, navigating deep snow with heavy clothes and lots of equipment. Limit the amount of time they spend on the slopes and intersperse it with other fun activities. That way everyone will still be up early and excited to get out on the new snow first thing in the morning. Undertaking a road trip can be a fantastic way to spend a summer. Taking in new sights and exploring previously unseen places can be thrilling, but only if you’re sufficiently prepared. It can be very easy to get excited about your trip and forget the essentials you need to set off with! Take a look below and make sure you’ve got everything you need to have the time of your life on the road! This should be common sense, but a surprisingly large amount of people forget to bring any nourishment with them. Eating well on the road is very beneficial. Not only will you have more energy, but you’ll save a lot of money on buying junk food. Healthy snacks like fruit and nuts will help tide you over and make sure to bring plenty of refreshments. Sandwiches are the best portable snack you can have for going long stretches without dining properly. Picnic lunches are also great if you find a nice sunny spot to sit down. You should try to grocery shop periodically as restaurants every night aren’t cheap! As well as consumables, items such as tissues and paper towels will come in handy. Medicine and first aid kits can be a lifesaver if you end up having an accident of any kind. Although it’s likely you’ve planned your route already, maps can work wonders. They are particularly useful if you decide to deviate from the beaten path – or simply get lost. They are also good for finding useful amenities during your journey. Anything from finding RV camper parts if your van is having problems, to seeking out the nearest petrol station are examples of what they can be used for. Nowadays, many people go completely digital. Whilst there is a quaint feel to using a traditional map, GPS systems can provide many of the same options, plus more. Although its lovely talking to your friends during a trip, it always makes sense to bring some of your favourite tunes to sing along to. Having an iPod or Smartphone for this purpose is more than handy. Make sure to take a variety of songs to fit your mood – listening to the same stuff will get stale! Blasting the radio is also pretty good, but traveling far out can cause you to lose signal. Regardless of whether you’re in the driver seat or taking a nap, comfy clothes and bedding will keep you warm. Loose jeans and tops will save you from getting uncomfortable. This also applies to shoes – slip off any tight footwear! Having a duvet and pillow are important for getting proper rest, especially if you have driving duties. If you and your buddies disagree on the temperature, you can always use your blanket to stay warm. Cameras aren’t as necessary as everything else on this list, but they are a wonderful addition to your itinerary. Any road trip will have fantastic memories for you to share with family and friends, and what better way to relay them than to have photos at the ready? Take these tips on board and you’ll have no problem planning your road trip. With all the work done for you, you can focus on what an amazing time you’re going to have! Is there a better way to see America than on the road? Many an explorer has set off from New York and made it across to the West Coast. You might not even have a destination in mind. It’s all about the journey, right? That’s how it was for Jack Kerouac. In his seminal novel, On The Road, he wrote about the beauty of traveling across the US. The excitement of meeting strange and wonderful people. Eating at a new diner every day. Waking up in a new state and just seeing what the world brings. So hitch up your camper trailers from Caravan & Camper Megastore or plan out the motel stops, let’s hit the road! You’ll encounter some strange things on your travels but here are some of the weirdest things you’ll see on your America road trip. You won’t see these from the plane. 1. A tree so big you can drive through it. Trees don’t come that big, right? Wrong. In Sequoia national park the trees are so big you can drive your car right through them. The trees are ancient Redwood trees and they are largest in the world. General Sherman is the biggest. Although, you can’t drive through him. Just look at him. Sequoia is a little off the beaten track – up in the Californian mountains – so you’ll need to make sure that you’re well prepared before you go looking for this one. There’s a strange place just off I-40 and Route 66 where you’ll find a row of Cadillacs buried nose first in the sand. It’s an eerie sight that began as an art project by hippies. Now, passers-by are encouraged to spray paint the cars and add to the weirdness. The infamous bullet-riddled car isn’t actually that easy to find. It is constantly moved around the country – last seen in Reno (so they say) so you’ll have todo your research before you set out. It’s worth it though to see this amazing piece of gangster history. This might be the creepiest thing you see on your trip. Maybe it’s just because small versions of things are always creepy. In Texas you’ll find a 1:3 scale model of the tomb of Qin Shi Huangdi. That’s the one with 6,000 terracotta soldiers. And there’s a 1:20 scale version of the forbidden city. Disney World this is not. There are – of course –hundreds of other strange sites out on the open road. Not least a beer-can house, a statue of Jimmy Carter as a peanut and an office that looks like a picnic basket. But you’ll have to discover them yourself with your dusty old ride, a tent or a motel room. See you on the road! Thanks to Angus MacRae for the image. Thanks to the resurgence in glamping, more people are indulging in camping holidays than ever before. This is great news for intrepid explorers who want to get back to basics, with just a sheet of canvas protecting them from the elements. Camping is a great way to be at one with nature. Camping in the UK can be somewhat problematic. After all, the rainy season never truly ends. But, if you want to guarantee sunshine and good times, camping in mainland Europe is an excellent way to explore the rest of the world. There are some fabulous locations within Europe that is solely aimed at the camping market. Let’s take a look at the top five. Camping in Austria is a great way to explore this beautiful country. Rolling hills, lush forestation and blue skies make for the perfect getaway. What’s more, you can drive from the UK to Austria with relative ease. It may be cost-efficient to fly, but do be aware of the weight restrictions when you go. Austria is a great place to camp. With pretty lakes and an abundance of wildlife, it makes for an exciting journey into the great outdoors. Pretty and picturesque, what could be better than waking up in Austria? Belgium is a firm favourite with many travellers. Camping in the Belgian countryside means you are only a short detour away from Brussels. This provides many with a heady contrast. The gorgeous countryside is not far away from the thriving city scene. You can combine your love of city and country within one foul swoop. Belgium is home to some of the most perfect riverside locations. Set up camp beside the river and explore the opportunities around you. Italy has an abundance of campsites within its area. The most popular place to camp within Italy is near Naples. With campsites in the Alps or Vineyards you certainly get a lot of choices. With these campsites, you have everything that you need on site. So, you don’t need to cart your diesel generators with you. The lush Italian countryside is only a short hop into the major cities. Rome and Pisa are only a short distance from the country. Use your campsite as a base to exploring this phenomenal historical country. With arts, history and amazing food in large quantities, you will be truly spoilt for choice. Jersey appears to be a forgotten gem with many. But, this delightful mix of Anglo-French is the perfect place to holiday. Camping in Jersey is wildly popular. With many dedicated campsites littering the country, you are spoilt for choice. This small island is made up of gorgeous beaches for you to explore. The charming countryside is ideal for hiking and pony-trekking. But, the beaches are divine, and an absolute must if you don’t want to do anything at all. With Lake Bled and the Alpine landscape, what is not to love about Slovenia? With a heavy German influence, it’s a great place to visit. There is a wealth of historical places of interest. The climate is moderate and warm, especially during the summer. Plus, you can hit the beach while you’re there too. So, you have fulfilled you dream and just taken possession of a motorhome. If you are lucky, you will have bought it new, but there are plenty of used luxury models available that have not completed many miles. Either way, it is standing on your driveway and will not come to life until you use it for your first vacation. You could drive it to one destination and park up, but what is the point of that when you have such a vehicle ready to take you on many adventures. A road trip is the order of the day. If you have never organised one before, you need all the advice you can get. You will find some useful tips here, on how to prepare for the road trip of a lifetime in a luxury motorhome. The insurance for this vehicle is different to ordinary car insurance because of its purpose. You might be pleasantly surprised and learn that the premiums are favorable. I prefer to get several quotes and compare them to ensure that I get the best deal. Before you set off, you must make sure that the vehicle is secure. The team at http://www.motorhomeinsurance.org.uk/get-a-quote/ know how a break in can spoil your trip. There are many alarm systems on the market that are easy to install and effective. We have a big map of the country at home, and we each push pins into it to indicate places we would like to visit. Now, the country is huge, so we usually work within a radius of one point. When all the pins are in place, the best route to get to them might jump out at you, but sometimes it takes much consideration. We might not be able to visit all of the places, but we do what we can. You must also find sites where you can park up at night. The internet is a valuable tool for your research.The system works well; give it a try and make up your mind. You must allow plenty of money for fuel; these beasts are thirsty! Calculate the length of the route and divide that by the average stated MPG of the vehicle. To be on the safe side, double that figure. It will allow for the extra fuel it will take to move a fully laden vehicle, and extra detours and excursions. You must be wise when packing for the trip. It isn’t an exact science; try to remember that extra weight will equate to fuel consumption. You will soon learn to distinguish essential clothing and items from luxury ones that you do not need. After a few trips, the process will become second nature to you and it will not take much thought. The day you set off is an exciting one. As the engine roars into life, your family is filled with a sense of curiosity and adventure. What does the next couple of weeks have in store for you all? That, my friends, is your story. When you are a planning a road trip, you might not know what you can do in order to make your road trip a success. You may feel this way more so if this is the first road trip that you are planning. Though planning a road trip is complicated it does not need to be impossible. As you read on you will learn precisely what you need to do in order to make your next road trip a success. When you want to go on a road trip, you need to make sure that you have a good plan in place. That means you need to be clear about the route you are going to follow and what you are going to do along the course you choose. You will also want to figure out what you are going to do in relation to food. Depending on the vehicle you are using you may be able to make some of your own food. However, in some cases you will need to eat out. It can help, therefore, that you include this into your plan. When you include such items into your plan, you will then be able to budget for them. That means you will then have a clear sense of what you will be able to spend on other things whilst you are on your road trip. That might include some recreational activities based on the locations you are visiting. You will also want to make sure that you have done some vehicle maintenance on the vehicle that you are going to be using. You can do this by taking your vehicle to a professional mechanic. They will be able to do the checks needed in order to make sure your vehicle is going to be road worthy. It might also be a good idea to install some other safety features on your vehicle if you get a chance. For example, if you are driving an RV there a number of things that you can do. One of these might be to purchase and install some gas detectors. When you want to buy some gas detectors for an RV, you will need to ask your mechanic about what is best. They will know which ones are best and what you should avoid buying. When you speak to your mechanic, you will also be able to find out about some other safety features you should be installing on your RV. Knowing this information will help prevent any problems from developing whilst on your trip. A road trip can be an exciting experience that brings you huge amounts of joy. For that to be the case, however, you’ll need to make sure that you have a good plan. You will also need to ensure that your road trip vehicle is up to specification. When you have done what you need to, there is no reason as to why you can’t have the best road trip ever.